I had the privilege of spending time with Geoffrey Deuel and his lovely wife, Jacqueline, in November 2011. Geoff has since given me permission to share with you my visit and a few photos that my friend, Dorothy (also a Pete Duel fan) took while we were in Geoff and Jacqueline’s home. First let me say that both Geoff and Jackie are some of the most down-to-earth, authentic people I’ve personally ever met. They are souls of integrity, forgiveness, and kindness. I couldn’t help but feel I was with my beloved family when I was with them. Geoff, Dorothy, and I spent time late one morning, after a dinner we had all shared the night before in an outside cafe, in a small room in the Deuel’s house. Geoff had gathered a number of vintage boxes and large, stuffed envelopes, and kept them in a corner. As Dor and I sat on the bed in the room, Geoff slowly opened the boxes and the envelopes and shared their contents with us. I can only tell you it was a privilege and an honor to have been invited into what was, till then, the private lives of Geoff and Jackie. I am at a loss for more words. I truly am. I am forever in their debt and I’m not deserving of their generosity — nothing made me any more special than any other Pete Duel fan. I happened to be in that proverbial right place at the right time. So it is with even more gratitude that I thank them for allowing me to share with you now some of the memories I will cherish for as long as I will hold them in my heart. In those boxes and envelopes that Geoff carefully opened and went through, item by item, were dozens of photographs, family pictures and keepsakes, a few seen already online and in books, but mostly never published before, of Peter from the time he was five weeks old till the week before his passing. We saw him as a baby, as young boy, as a man coming of age, and as the beautiful, masculine, handsome talent he became. It was all there: his youth, his joy, his dreams, his ambition, his heart. We went through Pete’s high school yearbook page by page. We held Peter’s Boy Scouts utensils in our hands. We laid eyes on pictures of Pete’s first love. But the most poignant item (for me, anyway) was Peter’s childhood scrapbook. It was filled with articles and pictures he’d clipped from magazines and newspapers when he was around the age of twelve: mostly of fast cars, leggy women, and airplanes. Throughout its pages were Peter’s notations, scribbled in pencil, about why a particular news article or magazine picture was important enough to him to keep. Dorothy and I cried some. And we laughed some. And we were overwhelmed. And the only thing that made the viewing of those pictures more special was that it was Geoff, Peter’s brother, who shared them with us. And Jacqueline, bless her heart, left us alone with him to do so. I never did thank you, Jackie, for your thoughtfulness that day, for imagining that we even needed the privacy, so if you’re reading this now, thank you from the bottom of my heart. It was an intense and a surreal morning. It was emotional and it was closure in some inexplicable way and it was a godsend. I felt such a mix of emotions, I didn’t realize how much they were at play till I left the state, flew home, climbed into my truck at the airport parking lot, drove on out to the Interstate — and only then it hit me. And hit me hard. I had to pull over and cry every last tear that had been bottled up inside me for the past twenty-four hours before I could summon the strength to drive home. Neither Dorothy or I could believe what he just asked us. He couldn’t have meant Pete’s hat, rather, Heyes’ hat, could he? He didn’t mean THE hat, right? Not the one we’ve all thought might be long gone. He couldn’t have meant THAT one. We must have looked shocked because he asked his question a second time. “Would you like to see Pete’s hat?” Dorothy was the first to speak in a quivering voice. “You have the Heyes hat?” “I have the Heyes hat,” Geoff said. “It rests safely with me” — and has for the past 40 years. So it is with honor and with privilege that I share with you four of the pictures Dorothy took that early afternoon when we got to hold in our hands the hat Pete wore when he played Hannibal Heyes. I added the picture of me hugging Geoff because I wanted to say something about his hugs. Geoff struck me as an unpretentious person, a warm, forthright, real, highly intelligent, dry-witted, worldly character of a man who has been through a lot in the last four decades. And yet his hugs were memorable. Strong. Determined. Sincere. I know many of you have asked about Geoff over the years, so I’d like to open up this page to your thoughts and well wishes to him (please be patient about seeing your comment posted; I’m gone most of the day and will get to it this evening; posts must be approved to weed out spam, unfortunately). I’ll send him the link in a few days so he can read what Peter’s fans have to say on this 40th memorial day of his passing. Thank you all for your kind words and for helping me keep Pete Duel’s memory alive by your visits to this site. And thank you, Geoff, for all you know we thank you for; thank you, Jacqueline, for your hospitality, kindness, thoughtfulness, and friendship, and thank you, Dor, for holding my hand throughout it all. Thanks for sharing your feelings of your dear brother who has passed on but never forgotten. You are blessed for having such a wonderful brother as much as he was blessed to have you. I’m glad the Heyes hat found its way home. Thank you for sharing this information about Pete Duel through his brother Geoff…loved the show as a pre-teen and would watch them over again, awesome actor from a prepubescent crush so many years ago. Wonderful to read this, my idol when i was a young boy and still. I remember the sad news about his dead on Swedish television, it was painful to hear. Sitting in a small cottage on the island of Gotland With friends and remebering Pete. It’s weird how I was thinking about Pete Duel this morning while walking my dog. It’s been years since I watched ASAJ, but as a ten year old back in 1974 I watched it religiously and was in ‘love’ with Hannibal Heyes. I was actually thinking about the hat as I ambled along. Came online and found this website and lo and behold, there’s the hat! I felt a bittersweet tug at my heart while reading this article about Geoff and everything he’s kept that belonged to his brother. I too kept a scrapbook of cuttings as a kid- who didn’t? Full of newspaper clippings and favorite comic strips, ads and characters from cereal boxes like Tony the Tiger and Toucan Sam. I also enjoyed the interview with Ben Murphy. He is right when he says that things come into your life at a certain age and make a lasting impression on you. Well, Kid Curry and Hannibal Heyes made an impression on me that’s never really gone away. Thank you for this lovely website and tribute to a lovely man gone too soon. I hope he knows that people still follow his ideals and that nothing he did was in vain, and that we don’t judge him for the decision he made that ended his life. We still love him and always will. A truly emotional piece to read – thank you so very much to all concerned. Laura for the words/pics and Geoff & Jacqueline for allowing us into the memories of a beautiful human being. How a man can still have such an impact on so many people almost 43yrs now after leaving us, truly is a mark of the man. I can’t even begin to imagine how Laura felt when Geoff asked that question and to see the pics has reduced me to tears again – so many shed for Pete over the years. The love we have for Pete will go on and the respect for his family continues to grow. God Bless you all and thank you again. Having just discovered Alias Smith & Jones and Pete and Ben was delighted to discover this excellent memorial site. Geoff and Jackie seem like exceptional people. It must be wonderful to know that after 40 odd years Pete is till loved a respected by so many people. May Pete rest in peace. Very touching. I stumbled onto some old episodes of Alias Smith and Jones, and immediately remembered why it was one of my favorite shows growing up. It brought back a lot of memories, some of which I had forgotten were even from the show. I remember my older brother and I playing around with the “five pat hands” trick, but I completely forgotten I first saw it from Hannibal Heyes. I wonder if Pete had any idea how much impact the character he portrayed would have on people, even decades down the road. Thanks for putting this website up. It has only been in the last few weeks that my heart and sadness has returned to those early 70’s. Alias smith and Jones is back on UK tv. Yet I find that my grief for the loss of Pete is deeper. Running along side is a rekindled admiration for both Pete and Ben in their roles as Hayes and Curry. The show remains one of my all time favourites, and will always hold a special place in my heart – along with both Ben and Pete. This grief is just so strange to deal with, there is a sense in which I need, want, to say ‘ Thank you ‘ to Pete – he may have felt at times his role was not enough, but for me, he helped me through those mixed up teenage years – he made a difference in my world. Hi Geoff and Jacqueline. My name is Suzy, and I knew Geoff as a friend back in the late 70s and early 80s. That was a tough time for you Geoff, after your brother died. Your pain was so great, my heart was broken for you. I am so pleased that you found Jacqueline and have a good life. I’ve thought of you on and off over all these years, wondering how your life was going. Now I know, and I’m a happier person for it. Take good care. God bless. I was thinking of Geoff and was happy to find out our friend from Venice Beach was alive and well. It has been years since those days of fun and friendship. I’d love to share some chat with him. Those days are some of Peter’s and my happiest memories. Lots of love. What a wonderful opportunity to share in some of Geoff’s memories of Pete. God Bless you Geoff and Jackie! You are special people and know that Pete’s fans love you and your family for sharing him with us all these years. He will never, ever be forgotten as long as we are alive to honor him. Took a dinner break from my writing jobs and found a channel running old TV shows. Saw Geoff on Adam 12 and just brought back so many memories of AS&J and the good times up in Topanga Canyon with Pete. I Googled Geoffrey Deuel, not knowing what I would find. First, found that he is still alive, which is great. Not many I search for are these days. Second, I found this site. Such a lovely tribute to the family and to Pete. Bless you all. Hello Geoff & Jackie: This Memorial Weekend is the 3rd anniversary of me losing the love of my life. He loved the movie “Chissum” and when I ran across it just the other night, I watched it like I did when He was alive. Seeing You in the movie brought back many old memories so I decided to search Your name and I’m so glad I did. I was just a teenager when Pete died. I had a mad crush on Pete and still remember well how devastated I was when I heard He died. It was like losing a close friend tho I never had the chance to meet Him. I am so happy to see this page that You All have created in memory of Pete. It’s a Beautiful tribute and I just know Pete would be proud & honored that it is available to those who still fondly remember His acting talents. I’m also very happy to see the You are doing great and You have a wonderful family structure in Your life. Best of Luck to You Both, “Thank-You” for sharing Your Brother with Us All & “Thank-You Laura” for creating such a caring, loving addition for the world to share. HELLO GEOFF AND JACKIE , HOW ARE YOU GEOFF LET ME SAID HOW MUCH I MISS PETE SO MUCH YOU AND PETE ARE BOTH GREAT ACTORS ,THANKING FOR SHARING YOUR STORY. LOVE YOU IN BILLY THE KID . GEOFF AND JACKIE, TELL PAM AND HER FAMLIY GOD BLESS TO HER.TAKE CARE LOVE ALWAYS MICHELLEK. Have just watched “Chissum” again. Geoff is great in this as is the late Ben Johnson. The only thing I share with Geoff is we were both born in 1943. As a Brit you would not be surprised films like this I was brought up with and very often the dialogue is better than the credit given for it. Thanks for all the memories. Dear Geoff and Jacqueline, Hello, l hope you and your family are well. Just wanted to say Thank you, Geoff, for sharing your brother with the world. Take care. Love, Cathy. It is surely a measure of the man himself that all these years later we remember him with such clarity and love! I was a massive Pete fan and lived for Monday nights when Smith & Jones would come on at 8 p.m., a young 16-year-old who thought Pete was the most handsome man who ever walked this planet! I was devastated when Pete died, but continued to watch the show just to see him smile. I have to say I couldn’t accept Roger Davis in the role and stopped watching, but continued to collect photos and articles on Pete wherever I could. I am so glad Geoff still has the treasured hat (not sure, but I think he took Pete’s dogs in too!). I hope Geoff and his family have happy and healthy lives; Pamela’s family, too. I’m sure I speak for the many Pete fans out there — as the hat remains in the safe hands of Geoff — that the memory and love of Pete will also be kept safe in the hearts of every single Pete Duel fan. Best wishes to the “family” of Pete and, as he would say, “Peace and ecology now.” All the best from a fan in the U.K.
Saturday was a time watching the Gidget episodes on TV and enjoying being entertained by wholesome talent that Pete brought to the program. Later watching Marcus Welby MD and Love on a rooftop, and then AS&J made an impact on my life teen life. Hearing about the death on the evening news was a shock to my friends and myself. It was Christmas break and hearing the tragic news was like burning all issues of Tiger Beat. The feeling that there must have been a mistake buzzed through the telephone lines amongst us teen girls. We were heartbroken living in the heartland where cowboys were very much alive. Professionally it has been a long battle watching the mental health and substance abuse field develop since the long line of tragic deaths associated with working long hours, expectations that are harsh and not understanding at the time, what obsessive personalities with high expectations can bestow upon those that battle such demons. I had read that somone tried to label bi-polar, but I feel that the demands that were made and the expectations that the actor had upon himself were a battle in itself. I am grateful that he appreciated nature and wish that it could have been adivcated with such people working on issues today. I am very please that YouTube and modern media has revived one of the best family entertainment programs ever. There were moral stories that the shows held and I wish those watching today would adopt some of the philosophies for a better place to live. Thank you for sharing the memories of someone that I feel should have been the Johnny Depp of the late 60s and early 70s! I know that the star that is on the blvd still shines because the actor watches over us all and is still alive amongst all of us that touched our lives the way that he did. Greatness and gifted, very unique. Last night, my family, my wife Maureen and our son Jeffrey, watched an episode of Alias Smith and Jones (episode #3 from season #1, Exit from Wikenburg). We enjoyed it very much. Good family TV. As soon as we got Neflix and Hulu, I looked up the show. I was so very happy to find it. I was 8 years old when Alias Smith and Jones was on TV. I really like Mr. Duel. Kinda of a big brother to me, since I don’t have a brother. It was one of my favorite shows and he one of my favorite actors. At school we would play Alias Smith and Jones, and I was Smith! Although at that age, I thought the people on TV shows were real people. I really wished I could meet him! I remember of hearing of his death, but I just don’t remember how. Probably from the newspaper or my parents. It was devastating, as a young boy, to find out that he died, and how. I had a picture of him in my mind being all alone that night, and what feelings that were going through his mind that would want him to end his life. I can still see the image in my mind of what the room might have looked like. Oh, what empathy I had for him, even though I had never met him.That image had been stored in my mind, and I had forgotten all about it. Only finding the show had re-awakened it after 40 years. Our world moves along so quickly – too quickly, and that the world moves onto some new thing or some new fad or craze. Please know that Pete is not forgotten, not forgotten by me, someone who never met him and never really knew him. But he made an impact on me as a small boy, memories of youth and of innocence, and of growing up. And I keep those with me to this very day, to avoid being polluted by the world. I wish Peace to you as you read this, and I wish Peace to Pete. Thank you, Laura, for this site because through you I am able to pass along my greetings to Geoff and hopefully, through him to Pam as well. I knew Geoff, Pam and Pete from our summer cottage in Haliburton Canada where they also spent their summers. They were great times in the fifties. I remember swimming off their raft; Mrs Deuel driving a car load of us into Haliburton one evening to see Elvis in ‘Loving You’; I remember Pete giving me a cigarette one night and saying “but don’t smoke it, Jackie… some day I’ll be famous and you can say Pete Deuel gave it to you.” I kept it in my scrapbook for years! I had a big crush on Geoff when I was 14 but it was not to be (ahhh… those summer romances!) Sounds like you got yourself another “Jackie” in the end. Good for you. Last time I saw you, Geoff, was at the government dock in 1968, you had grown a beard and I thought you were Peter at first. I was with my two kids and you were with Pam’s little girl. We sold our cottage in 1972. Thanks again, Laura, for the site so I could post greetings and a few memories. Dear Geoff, I’m a big fan of your brother Peter, I was only 5 months old when he passed, but as I was growing up my dad would watch Alias Smith & Jones reruns with me, he was a fan of your brother as well years before I was born. It was so wonderful for you to share your home with Laura. God Bless! Dear Geoff, I saw the pictures you had on eBay. They were awesome. So sorry I missed out. I sure hope there will be some more. It was so nice of you and Jacqueline to share memories with Laura. It truly touched my heart. I hope that you and your family are doing well.God Bless. Geoff; Thank you so much for coming forward and allowing this article to become available to those of us diehards who simply refuse to forget your brother. I have often wondered over the years what had become of you. You had such a promising career in the film industry yourself, but I suppose, not surprisingly after Peter’s death you just up and disappeared. So, I often found myself just casually wondering; what did Geoff end up doing with his life? What was his career? Did he marry? Did he have children? Anyway, it’s all non-consequential, but just being able to read this article and know that you are still with us and apparently found happiness in your life has somehow brought a little bit of peace into mine–silly really, but anyway, that’s life with a creative being! So pleased to hear that you have his hat!! And what a thrill to see it again–just as battered and dusty as it was forty years ago! Thank you again for letting us in to a small part of your life and for letting us all know that you’ve done well. Yep, that’s what brothers do. God Bless ’em. The Hat looks wonderful by the way, after 40 years, It must have been wrapped very carefully. The best thing, for me, in regards to AS&J…was the wonderfully, natural chemistry of Pete and Ben …it was brilliantly simplistic. Thank you for this story and photos. Thanks to you both, we all appreciate letting us into what is a personal and private memory for you, if you could feel the love that flows from our hearts for Pete, then this with Gods grace should also lift you and your family.. I was only 15yrs when i first saw Pete i started up and ecology programme in school and headed it the Pete Duel Ecology Drive, i no longer, even at the age of 56yrs can pass a piece of litter i see on the pavement, and call to people who drop anything and ask them to dispose of it correctly . The Picture of the hat wow that hat is in very safe hands thank goodness. Take care of yourselves, love from accross the pond. and God Bless your family. Suzanne. It’s hard to believe it’s been 40 years already. After all this time I still remember that morning. I was 10 years old and at my grandparent’s house in West Virginia. My granddad had turned on the radio and the announcer broke the news of Peter’s passing. It felt as though my heart had been ripped out. I’ve thought of him often over the years especially at New Years, his birthday (which happens to be the same day as my mother’s) and trips to upstate New York to visit in-laws. He is so dearly missed. I’ve often though of you too, Geoff and Pamela, and hoped you both were doing well. Finally, thank you Geoff and Jacqueline for inviting Laura into your home and allowing her to share her visit with us. God bless and and your family. I am sitting here right now watching Alias Smith and Jones with my 10 and 12 year old sons. They love it as much as I did when I was little. I ran across a channel that has the 2 seasons of the show on. Amazed at how much I remembered I checked in to years to see how old I was. I was born in 1963 so I was little. I even remembered the story about Pete Duel’s death and remembered being sad. Altho that is the only show I remember him in he def caught my attention if I remember him as a kid. A great actor. Even watching right at this moment as an adult woman I can see why he was loved as an actor. He could sing too, just sang in the episode I am watching. Loved that the hat was saved all these years by his brother. Glad the family got it. Glad I have the opportunity to share a great show with my kids! Thank you Geoff & Jacqueline for allowing us to share in your incredible memories. I just found this site, as I had been thinking lately of how saddened I was when Peter passed away. Incredible, intolerable loss for everyone. This means so much to me to be able to be in contact with a very important part of Peter. God Bless you and you family in every way. I have not been on in a while but wanted to remember our Petes birthday when I found out about this visit with you and your wife. This moment I can certainly see why it was truly touching and seeing the hat even more so. I have often wondered how you were doing Geoff and am glad to hear you are well. I knew you had moved to Florida and always hoped one day to “bump” in to you as I live in Orlando. :o) I had been to visit Penfield about 4 years ago and talked with “Kelly the Cook'” at Penefield Hots behind the Deuel home. She said sometimes you visited. I told her if she ever saw you, I had 2 drawings I did of Pete for a memorial I would like you to have copies of if you would like to. I had given my email but never heard back from her. I had laminated and made 2 signs I wanted to leave at Oakwood but they did not allow these things sadly. But, for the 2 hours I was there I set them up with other items while I tidied up some and played music I knew Pete would like by Michael Tomlinson whose messages are about peace, love, friendship, and protecting the environment . It was peaceful even as it rained and the candles flickered in the wind. I believe he knew I was there…I had made a promise 40 years ago, no matter how long it took I would visit him, though of course I never realized it would be this long but things just all of sudden fell into place, odd, and even though it was heard to leave, I also felt he let me ” know” this as well, and tearfully I packed up my treasures and bid Pete farewell, and though I will be leaving Penefield he will always be carried with me safe within my heart, and in many of the things I do inspired out of my love and respect for him. I only hope it will not be another 40 years…. I will always treasure this memory of my “visit” with Pete. Peace and Ecology Now and Forever…. Dear Geoff and Jackie, Hello, just wanted to say, l am thinking about peter today and all your family, God bless you all love cathy. When I was thirteen or so, your brother was gone for years already, but I loved him so much. We here in The Netherlands watched Alias Smith and Jones and I adored him. It was a very difficult time for me back then, but I had this idea that your brother was with me, in spirit and he helped me all those difficult and very lonely teenage years. Years and years have passed since then, but every time I see a picture of Pete, it still feels as if I am looking at a very beloved friend. I think your brother was a beautiful person and he will not be forgotten. It makes me happy to learn that there are still so many people who share these feelings with me. I THINK IT’S WONDERFUL THAT GEOFF HAS PETE’S HAT AND GLOVES- THEY COULDN’T HAVE GONE TO A BETTER HOME- IT’S VERY TOUCHING TO KNOW THIS- AND HOW KIND AND GENEROUS OF GEOFF AND HIS WIFE TO HAVE OPENED UP HIS HOME AND LET YOU SHARE SUCH PRECIOUS MEMORIES OF HIS BELOVED BROTHER- WHAT WONDERFUL MEMORIES YOU AND YOUR FRIEND WILL NOW HAVE FOR A LIFETIME!! IT SHOWS JUST HOW KIND AND CARING GEOFF AND HIS WIFE ARE. I JUST WANTED TO SAY THAT THERE WERE IN FACT MORE THAN THE ONE ICONIC HANNIBAL HEYES COWBOY HAT WHICH PETE WORE- THERE WAS ALWAYS MORE THAN JUST THE ONE ITEM- FOR CONTINUITY- I WAS TOLD THIS FROM THE PERSON WHO BOUGHT ALL THE COSTUME DEPT WARDROBE ITEMS. BEN TOLD ME BACK IN THE 80’S THAT HE KEPT ONE AND IT WAS STORED AWAY IN A STORAGE BOX, BUT THAT HE NOW ISN’T SURE EXACTLY WHERE IT IS-THE LATE STUNTMAN MONTY LAIRD KEPT ONE- AND ANOTHER STUNTMAN KEPT ANOTHER- SO LOOKS LIKE THERE WERE 4 HEYES HATS INCLUDING THE ONE GEOFF HAS KEPT ALL THESE YEARS. IT’S THE SAME WITH THE PROPS USED ON THE SERIES [THESE WERE LOANED OUT FROM ELLIS PROPS OF HOLLYWOOD] THERE WERE ALWAYS MORE THAN ONE OF EACH ITEM [SAY AN OIL LAMP OR A SHOT GLASS- INCASE OF BREAKAGES ETC- FOR CONTINUITY PURPOSES]. HAVE TO BE WASHED/ETC ETC. 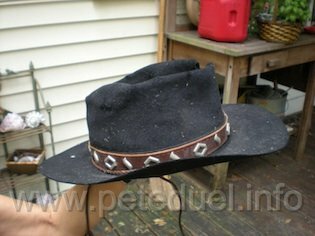 RE THE HAT GEOFF HAS OF PETE’S AND SEVERAL FANS MENTONED HE MUST HAVE WORN IT A LOT AS IT WAS VERY WORN AND BATTERED- MARK MEJIA FROM BARON HATS TOLD ME THE HATS CAN BE ESPECIALLY AGED TO LOOK DUSTY- OR HOLES PUT IN THEM- TO LOOK LIKE THEY HAVE BEEN RIDING THE TRAIL FOR A LONG TIME. 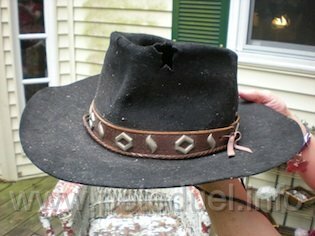 WHEN I ORERED A REPLICA HEYES HAT SEVERAL YEARS AGO- MARK ASKED ME IF I WANTED IT TO LOOK AGED- BUT I SAID NO. I’M NOT SURE HOW MANY OF THE BROWN HOMBURG HATS WERE MADE WHICH PETE ALSO WORE IN THE SERIES [WHEN HE WORE THE BROWN SUIT IN MANY EPISODES OF ALIAS] BUT I HAVE ONE OF THE ORIGINAL ONES HE WORE- IT HAS HIS NAME STAMPED INSIDE FROM THE COSTUMERS- AND IF FANS ARE INTERESTED- MARK TOLD ME HE AN ALSO MAKE REPLICAS OF THESE TOO IF ANYONE IS INTERESTED. HOPE THIS BIT OF INFO HAS HELPED! All I can say is I think this is BEAUTIFUL, TRULY BEAUTIFUL. Thanks Laura for all the work you’ve put into your memorial website. For most of Pete’s fans, the ‘Hannibal Heyes’ hat is like a family heirloom; so knowing that ‘it rests safely…’ with his brother Geoff, is totally right. I read in an article where Pete described his brother as ‘his best friend’. It seems only right that the most iconic things that Pete wore during his career are those things ‘his best friend’ has taken care of for 40 years. That’s what best friends do. That’s what brothers do. Thank you Geoff for letting us share that with you. Thank you Laura for posting on your site and sharing that with us. That hat was well made huh? It’s held up this long – so it’s obviously cared for. From all the comments listed above, I hope you can see Geoff how people feel about your brother (and about you). I can only imagine how much you and your family must miss him. Happy belated birthday and best wishes for this year to you and your family. Happy new year to you too Laura! (all the way from Saudi Arabia). Happy Birthday to you Geoff, one day late. Sorry. Thanks again for your kindness to Laura and Dorothy and to all of us. Many blessings and peace to you and your extended family in 2012.
dear Geoff, happy birthday, have a nice day today and may all your days be happy, God Bless you and your family always and forever love Cathy. Thank you so much for sharing this visit with us all. It means so much. Like many of Pete’s fans I have been thinking of him a lot. Thank you especially to Geoff and Jackie. Your generousity touches our hearts. The HAT. Oh goodness. I’m start ingto cry at the thought. Just knowing that is has been kept and treasured all of these years is overwhelming. Thank you Geoff for keeping it safe. Pete seemed to keep wearing that hat even when it started to show signs of wear. It says a lot about him. Thank you very much Geoff, Jackie, Laura, and Dorothy for sharing so much with all of us. It is deeply appreciated. Thank you so much for sharing your experience. I felt so excited for you and for all Pete’s fans as I read it. How wonderful of Geoff to share such precious memories and for him to allow you to share them with us. And the hat! How iconic a symbol of Pete is that and now we know where it is. I am so glad Geoff has it. Laura, I have read your account of that amazing day with tears in my eyes. To have spent time with Geoff and Jacqueline and to be able to look at items that belonged to Peter is so wonderful. As for the hat..what can be said about that! Thank you so much to Geoff for sharing personal things about his beloved brother and I hope he knows he is so fondly thought of as well. And thank you Laura for a truly wonderful memorial site which is so fitting to a truly wonderful man who will never be forgotton. It was lovely of Geoff and Jackie to let Laura and Dot spend time and share precious memories of Pete with them. I am sure even after forty years they still feel so much pain; it must have been so emotional — and to actually hold Pete’s famous hat must have felt so overwhelming. I wish I could have been there with you. Pete will always hold a place in my heart and will always remain special. In Alias Smith & Jones, he was the show and it wasn’t the same without him (sorry, Ben & Roger). The day Pete died a part of me died with him. My wish now is to visit Penfield to where Pete lies. I have waited for so long, I only hope this is the year my wish/dream comes true. I wish Geoff and Jackie all the best for 2012. Thank you again for keeping Pete’s memory alive. I only wish he was with us today. There will never be another Pete. Happy Birthday, Geoff, for the 17th January. To my sister, Laura. I’ve always known you to be a fan of Alias Smith & Jones from the time we were little. Your fondness for not only the characters of AS&J, but also of the real men behind the movie set has always rung true throughout the years. But only now, after reading your story here on this website have I come to know how much Pete Duel really meant to you. And to all of his fans. I think of those I’ve known and lost and placed them into my mind as you have with Pete in yours, and it all becomes perfectly clear. Thanks for sharing. With love, your brother, John. Well, seeing these pictures has made me cry like the 16-year-old I was when I heard the news 40 years ago. God bless you and your family, Geoff. I hope you’ve found some peace. I will never forget your brother, nor your kindness in sharing this with us. I hope Pete knows that he made a difference, and has inspired many of us to try to do the same in his honor. It’s me again. I just wanted to say again thank you for letting Laura and Dot into your home and saving Pete’s hat and gloves. I am very overjoyed about that. I have wondered over the years what had happened to them. I also would like to add that I was 10 years old when Pete passed. I remember it very well and I was heartbroken. He was and still is my hero. My bedroom walls were covered in Pete’s pictures. Thank you, Thank you, Thank you, Geoff and Jacqueline, for putting my mind at ease over Pete’s hat. It really worried me what had happened to it. And to Laura and Dot for sharing this with Pete’s fans. We all thank you. God Bless all of you. I’ve been reading all these wonderful things you all have posted and wondered, what could I possibly add??? I’ve been a huge fan of “the Brothers Deuel” since forever! One entire wall in my bedroom was devoted strictly to Geoff and Pete. Several years ago my then 17 yr. old daughter plopped down on the couch next to me while I was watching my favorite movie, Chisum. She’d been raised on that movie, thanks to me, and yet that day she saw something different. Geoffrey Deuel! She looked at me and said in a wonderful southern drawl (we’re from Minnesota), “Mama, can I have him?” I told her no; he belonged to my generation! I’m so thankful to you, Laura, for keeping Pete’s memory alive. Meeting Geoff and Jackie must have been a major highlight in your life. Just reading about it was one of mine. Thank you, Geoff and Jackie, for letting these ladies into your home and sharing with them so they could share with us. I’ve wondered about you, Geoff, for years. I’m glad you’re alive and apparently well. I hope you’ve found peace! What a joy to read this article on a day that for so many of us brings great sadness. Thank you, Geoff and Jackie, from someone who will never forget your brother or your kindness. Dan, I know what you mean as far as feeling like Peter was a big brother! I was [still am, I guess..] an only child, and when I saw Peter, I felt that he was the kind of person that would have made a great big brother! I never saw Peter as the, oooh, let me faint into his arms’ type of guy. HE just felt comfortable to watch in his roles, no matter which ones they were. Yes, Melanie, I still think of him that way after all these years. But I don’t post often, cause I realize that most of the fans view him in a different way, in a romantic fashion…which is OK, but not my “cup of tea”. Don’t assume most fans feel romantic toward him. Many of us, maybe even most, had a more emotional attachment than you realize. Hence why it’s lasted this long for so many of us. That was the nature of Pete Duel. His warmth, his humanity, and his presence transcended the romance. Not saying all, just many that we’ve run into feel that way. It’s good to know there are many people who feel a kinship beyond the normal ‘Hollywood thing’ are out there. I think we all feel Peter had something above and beyond the norm! Geoff and Jackie, thank you for your generosity in opening up your home and privacy to Laura and Dorothy. Such a wonderful act. Thank You. Laura and Dorothy, I thank you for make it so that i feel as though I am with you. All the love in the world to all of you. Thanks Laura for sharing these photos and the story of your trip with all of us! Yes, Geoff! There are some male fans out here. I’ve always loved cowboys, but I saw some of Pete’s other roles. I was a foreign language major in college, and when I was visiting friends in Austria some years ago, I took the train into the Czech Republic to Prague. When there, I found myself looking for “Ondrej Cernin” the name of the role he had in a Name of the Game episode called the White Birch. I walked across the Vltava River’s Charles Bridge and walked up the hill on the other side to St Vitus Cathedral and the castle for a Mozart concert. I thought I just had to see him somewhere. I bought flowers for the memorial to the martyrs of the Prague Spring in Wenceslaus square. I don’t know much Czech, so spoke German while there. But apart from Smith and Jones, that was my favorite role of his. I think of him whenever I play Smetana’s “Moldau’ (German name for the Vltava River). My own big brother was not kind to me as a boy, so somehow, I sensed a warmth and gentleness in Pete’s roles and used to wish, to pretend that he was my big brother. And over the years, that has stayed with me, although God has given me other, real brother figures and even now…in my 50s, my brother and I are beginning to really talk for the first time after all these years. But I continue to pray for you and the family on a regular basis, as I did for him when I was a kid. Love you, and sending a tight bear hug. What a wonderful way for the New Year to start. The article and the pictures of Pete’s Heyes Hat brings joy to my heart. What an amazing surprise to find that it is not lost after all. Thank you so much Geoff for sharing these precious memories with Pete’s fans. Pete touched so many lives and it’s sad that he never truly realized the love he inspired … for himself, for animals and for the planet we call home. He will forever be remembered as long as his fans are alive. Thanks again Geoff and Jackie. We appreciate you so much. Although, I have always been a fan of Pete, I have also been a fan of yours. You were both very talented men. Wishing you God’s blessings in 2012. Wow Laura and Dorothy it must have been such an emotional time for you both. What a great privilege it must have been to meet Geoff and his wife Jackie. Laura you do such a great job in keeping this site going, it’s a great way for us fans to honour Pete Thank you for that and my best wishes to you. Dear Geoff and Jackie, Thank you so much for sharing such precious memories of Pete with Laura and Dorothy, and thank you for allowing them to share it with us. Your brother meant so much to us. I hope it gives you some comfort to know how much he meant to us and always will. I also wanted to let you know that as well as following Pete’s career, I also followed yours and enjoyed many of your tv appearances and your role as Billy the Kid in Chisum. I hope you are both well and I would like to wish you both a Happy New Year. For some reason, I began thinking about Pete Duel and Alias Smith and Jones today. I remember that during a very difficult time in my adolescence, I found the show and the onscreen Pete Duel to be a great comfort to me. He always seemed such a genuine person and I was able to find escape watching him in the role — an escape I desperately needed at that time. So nice to find this page today, to read the article, and to read the comments of so many other fans. My thanks go out to him and his family. And the hat is so cool to see! Knowing that this trip was about to take place, surely made an impact on me ! I was so happy for both Dor and Laura, that they were able to experience this. My biggest thanks to you both, Geoff & Jackie !! People as goodhearted and kind as you, are very rare nowadays. To me, Pete was, and will always be “the” star … my guiding star. I’ll just say one thing: Thank you so much both to Geoff and his wife and of course to you Laura. Pete will never be forgotten thanks to all of you. Love you from the bottom of my heart Pete. Geoff, Jackie, it must warm your heart to know so many people still hold an affection for Peter after all these years. Peter means so many things to so many people, and I think you can see that here. Forty years is a long time, but in many ways it seems like yesterday that I was that 16-year old girl. Thank you for opening up your hearts and your home to a few and the rush of many through this board. Geoffrey & family, thank you for sharing your Peter with us all. He was truly a talented actor that touched so many in his short life. Thank you for sharing “the hat” with us, it is a beautiful surprise to know what happened to it on this sad 40 year anniversary. It brought tears to my eyes. Thank you Laura for this wonderful site that is helping to keep Pete’s memory burning bright. I am so happy to know that both of you had the privilege to visit Geoff and his family, and to have the privilege to see Geoff’s treasures of Pete. I’m also relieved to know that Geoff is doing fine as well. My sincere gratitude goes to you Laura for working so hard and in such a respectful, caring way on this website in memory of Pete. My heartfelt appreciation also goes out to his family, who have survived a blow that had to be utterly devastating. I, of course, was never lucky enough to have met Pete, but he has had such a profound effect on me. He makes me want to be a better person, a better wife, a better mother, a better human being in his honor. His life was much too short, but I hope it gives his family comfort that he is still so fondly remembered by people all over the world. Thanks to Geoff and Jacqueline for their compassion toward Laura and Dorothy and the gift they shared with all of us. Peace and Ecology now. Pete knew, we need this now more than ever. Long been a fan of Pete Duel. Real star. I have a long list of ‘what if’s’ in my head. Pete Duel not leaving so soon is one of those things I think of. I can only imagine what he’d be doing as a person and an actor today. I loved Alias Smith and Jones. A true classic that also ended too soon. At least the Duel iteration. Wow! Thinking about what could have been. I should also add, cool article, cool you got to meet and have that experience, and cool site. I appreciate your zeal and devotion. Someone needs to do it. Well, here I sit reading all the wonderful thoughts and the love that ebbs through this computer screen … I am still in awe of the experience Laura and I had together visiting Geoff and Jackie (and funny little Lilly), the most wonderful, gracious warm-hearted people I ever met in my entire life. I love you both dearly … just as I love Pete. I deeply thank Laura, my soul sister for asking me (ME!! GASP!!) to accompany her on this. What words can I use to describe this but amazing, heartfelt, journey into the lives of two people I never dreamed I’d ever see in person, but to enter their home! I can’t believe that forty years has gone by like a snap of your fingers; it seems like just a moment ago. Geoff, your brother meant the world to me and now, with gratitude and a heartflet thank you, you’ve stepped into his shoes for me, just knowing you’re there when I need you and Jackie to share him with us. How beautiful you are!! I love you both, and Laura, well, you know!! dear Geoff and jackie, thank you both, God bless. Peter will always be with us, within you Geoff and Pam and the Deuel family, he is forever in your hearts and in all the people around the world, that truly admired him, a natural actor, a gentle man who cared too much,may God keep him in his tender care, PETER E DEUEL God bless. Thank you so much Geoff for sharing “the hat” with us. I noticed that as the show went on, the hat was wearing out. I kept expecting a replacement, as if his hat would magically renew itself or he would get a completely different one. Peter kept wearing his original one until the hole got bigger and bigger. Now looking at the picture of the original, the large hole in it looks like a star shape to me. That is very fitting for Peter. What a great gift Geoffrey Deuel shared with all the fans of his brother, Peter. I was very excited and happy to read about your experiences, your proverbial being there at the right time. I hope Geoffrey Deuel can experience and feel how loved and respected his brother Peter is. He will never be forgotten. How special and fitting of Geoff to make this possible, so that we can all get close to our inspirator/idol/friend or whatever he meant to each individual. I hope that the knowlegde of the fact that his brother is still very much alive in many hearts all over the world makes the memory of his loss lighter to bare. I thank you. It has been my 40th birthday. I will always feel a special connection to the man whose footsteps I tried to follow this year. Thank you so much for sharing so much. It is very much appriciated by many people all over the world. Last July I made a trip to your old hometown Penfield. I stayed there for four days at Penfield Road. I am probably one of the few male fans amongst all the women who still adore Peter. 27 November 2010 I had your brother’s image as Hannibal Heyes tattooed on my arm forever. The artist (in my opinion) delivered a great job in capturing your brother. I can’t include a picture here, but if you would like to see it, I can mail you the image through Laura or you can check out my Facebook profile picture: Roger Wouters. I have included a link for a trailer I made of my Penfield trip: http://www.youtube.com/watch?v=5xBonVVCgCA . Again I thank you and your wife for sharing this with Laura, who made this beautiful tribute for your brother. I was very moved, reading your account, and it means a lot to know that all the things that were important to Pete, growing up and during his life, are still lovingly kept by his family. Reading about them, and seeing the photographs, brings back a real sense of him. I’m sure all of us wish we could have been in your shoes! A big thank you to Geoff for being willing to share such personal and private memories. One never completely recovers from the loss of a loved one, but I hope you can take small comfort in the knowledge of how many lives your brother touched and influenced, and continues to do so. And while he may not be here physically, spiritually he will always have been around, keeping a big brotherly eye on his family. None, or very few of us, were privileged to have ever met Pete, but, through you, we have been given an insight into the kind of person he was and I’m very grateful for that insight. Thank you Laura, for sharing this wondeful story and creating this moving memorial website to Pete Duel! Thank you Geoff and Jackie for opening up your home to Laura and sharing such wonderful memories of Pete with us. Pete will always be in my heart, there is not a day that goes by that I do not think of him. He was a talented actor and Wonderful Man who cared about the environment, people and animals. There will never be another Pete Duel! You are truly missed! Rest in Peace!!!!! What a positive spin to put on such a tragic night. That hat just captures everything I feel about Pete. It is absolute perfection with all is rips tears and flaws; it is still beautiful and has withstood the test of time. The gift all of you have shared is the best one yet, since Peter’s awful demise. This sets it all straight and eases a lot of minds. Many thanks to all. I am going to bed tonight with the warm fuzzies because of this. Rest easy and in perfect peace you dear man. Much loved, much remembered, and YOU DID MAKE A DIFFERENCE! My grief at Peter’s loss is still overwhelming at times, even 40 years later. I can only imagine how it must be for you and for Pam. I pray always for the continued healing and comfort of God’s presence in your lives. Thank you for allowing Laura and Dorothy, the ambassadors of the many fans of Peter’s, to come into your home and share something so precious. What that hat represents to his fans cannot be explained in words. After reading Laura’s book, “Remembering Pete Duel,” I feared the hat was lost to us forever. I’m so glad it’s safe with you where it belongs. One thing I have learned in the last few years, Pete’s fans share a special connection no matter how far apart we might be. It is a spiritual connection that we share with you and with your sister. And Peter is the link. Please know that you are never alone in remembering him or in grieving for him. You have my deepest sympathies. Please extend them to your sister as well. I just want to say that all these years later and at this time of year and time of the day I still miss Peter Deuel so much. I wish with all my heart, as do many I know, that he was still with us. The pain seems never to ease. I don’t suppose it will now. It’s been so long with me. I feel broken! Dear Geoff and Jackie — Thank you for sharing your home with Laura and, in turn, with us. Our hearts are with you during the anniversary of Peter’s passing. His presence, however brief, touched all of us and remains even after 40 years after his departure. May his memory always give you comfort and joy. Dear Laura — Thank you for your tireless and insightful website that keeps the memory of Peter alive. Your spirit and generosity mirrors what folks say about Peter. May his spirit forever nourish yours. I am lost for words. 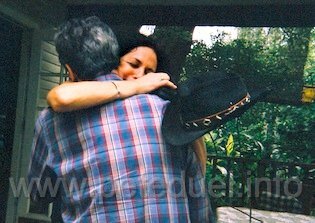 To see his hat and you (Laura) hugging Geoffrey shows the emotion that the visit must have been. Pete is gone for so long but to touch the hat must have made him feel close again. I don’t know how I would have reacted but I think it would have been pretty much the same. I probably would have felt I had to pinch myself afterwards and felt totally overwhelmed by it all. Thank you for sharing this special moment with us, Laura and Dorothy, and most of all thank you so much, Geoffrey and Jacqui, for sharing Pete with us all. It’s truly amazing. Laura, your story brought tears to my eyes. What a lovely, precious, unforgettable visit that was for you and Dorothy. Thank you so much for sharing it with us … and for the kindness of Geoff and Jackie for welcoming you into their home and permitting you to share your visit with all of us. Geoff, I would like to thank you for sharing your beautiful, talented brother with us. It must still be terribly sad for you and your family … especially at this time of the year … even after 40 years. I know how much my heart continues to ache and I never met Pete in person. I don’t know what drew so many of us to Pete … and stayed with us for 40 years … his unequalled acting talent, his beautiful smile, his concern for the environment. He was one-of-a-kind. A person is not remembered by the length of their life, but by the depth of the hearts they touch. Your brother, Pete, touched MANY more lives than he ever knew … and he continues to influence us in many different ways. Many of us have visited his final resting place to “tell” Pete about the joy he gave us … and continues to give us. It is nice to be able to tell that to you also. I am happy and thankful to know that “the HAT” rests safely with you. Just seeing it in the pictures again brought tears to my eyes. Thank you, Geoff and Jackie, for sharing a part of Peter with all of us. We are forever grateful. I wish you both comfort in knowing that Pete is forever alive in our hearts. Wishing you and the rest of the Deuel family comfort and health in the New Year. I would like to thank Geoff and Jacqueline Deuel for letting Laura share this with Pete’s fans and putting this on the Pete Duel website. And the beloved hat. I want to thank you for saving Pete’s hat and that it rests safely with you. God Bless you and your family.